← Library Search Tool Primo Gets an Upgrade in early August! August 21, 2017 – January 19, 2018. 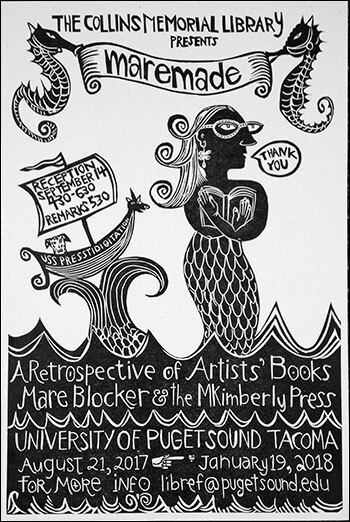 Collins Library is honored to showcase the career of Mare Blocker in this retrospective exhibition that runs through January showcasing her early work as well as the most recent project My Beloved Community Dictionary Project. For this project Mare invited 200 of her closet friends to contribute a 6 x 8 linoleum block of a single word that will be woven together to form a community quilt of words. According to Mare, “I have always been drawn to illustrated dictionaries. I love their little pictures, charts and lists of cities and places. I’ve been contemplating a dictionary project for years, and now that I have my power press up and running smoothly, it’s time to jump into it.” Mare received her M.F.A., University of Idaho, 2006 and her B.F.A, in Ceramic Sculpture, University of Washington, 1982. She is a member of the faculty of Pacific Lutheran University and serves as an Assistant Professor of Art and Design. She teaches classes in the art of the book and printmaking and was instrumental in established the Thornily Printing Center at PLU last spring. She is the recipient of numerous awards and accolades and you can read more about her work by visiting her blog site.